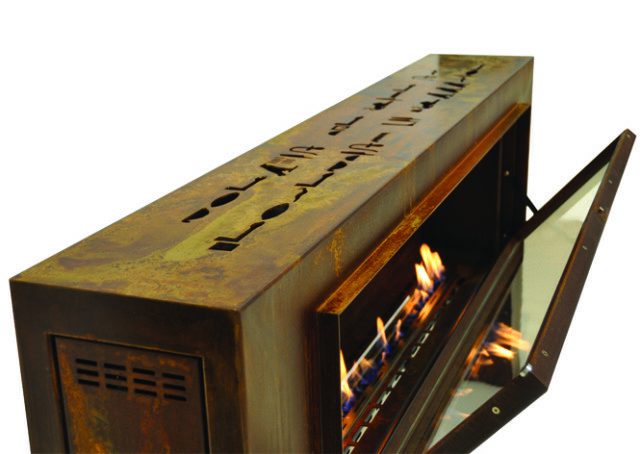 Designed to emphasize the natural power of fire, Fogly bio fireplace combines energy, strength and outstanding beauty of element. Massive construction and unique design of the housing draw our attention and invite to take part in the amazing fire show. Its structure consists of seven attributes that guarantee the unforgettable experience. They include: simplicity, safety, economy, intelligence, efficiency and ecology. Simple, geometrical shapes, pretty big dimensions: 1500 cm wide and 800 cm long. 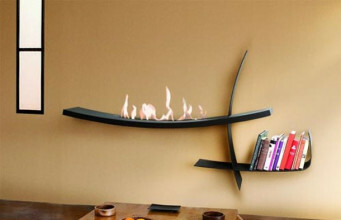 Bio fireplace by Portuguese brand Glammfire is one of the most massive type of devices. 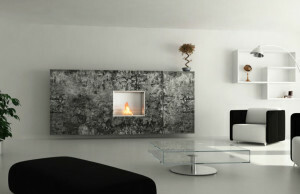 Because of enamelled stainless steel used for manufacturing it, the bio fireplace looks rough. Rusty-ginger colour harks back to industrial times, when fire was the base, always present element of space. 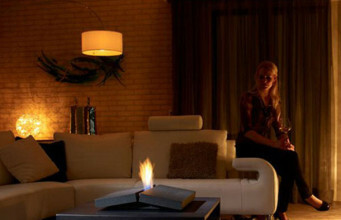 Using bioethanol as a source of fire, bio fireplace is also simple in use and maintenance. It doesn’t need chimney-ventilation system, doesn’t emit harmful substances and it can be located at random place: both indoors and outdoors. 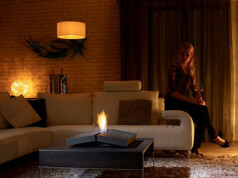 Bio fireplace Fogly by Glammfire uses the modern combustion technology – Crea7ion. Due to internal regulation system, the use of bioethanol during combustion was reduced to minimum. 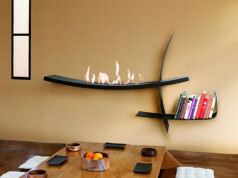 The obtained effect is the connection of full fire potential and small use of energy. Unique experiences, comfort and user’s safety determine the design of device. That’s why, the bioethanol fuel tank is placed in separately from the combustion area, and small quantity of substance, necessary for feeding the fire, guarantees the control of whole process. Considered selection of Fogly’s components allows to optimize its efficiency and practical, easy use. 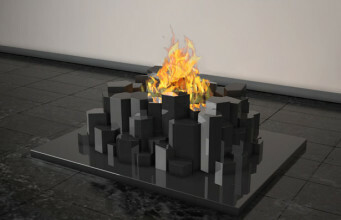 Dynamism and functionality was achieved by connecting two systems of lighting the fire – ecological and mechanical. Appearing of the fire and its height could be regulated using a remote control or in a mechanical manner – using the button placed on the device. 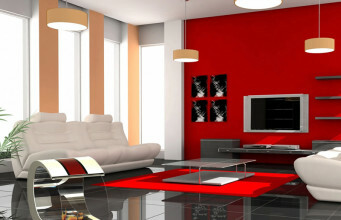 Furthermore, lack of chimney-ventilation system keeps all warmth inside the room, giving bigger thermal effectiveness. 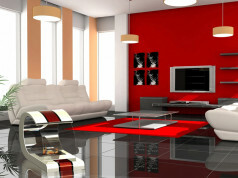 Due to Crea7ion system, high quality, functionality and elegance design were joined in an eco-friendly way. 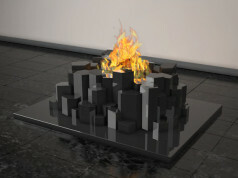 The optimal use of biofuel allows to enjoy the fire for a long time without the need of filling up the liquid. Furthermore, during the combustion the limited quantity of CO₂ is emitted, which reduces the occurrence of poisonous gas, in regard to the traditional fireplaces.